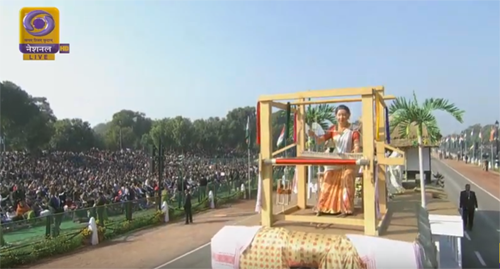 The Assam tableau showcased ‘Manchester of the East’ – Sualkuchi in all its glory at the 70th Republic Day Parade in New Delhi on Saturday. The Ministry of Defence has approved it on January 21. The tableau presented the hard work and dedication of the local weavers at the national level. Assam displayed Mahatma Gandhi’s visit to Sualkuchi in the year 1946 – which is often referred to as the ‘Manchester of the East’. Music legend Bhupen Hazarika’s song ‘Jai Jai Ram Rahim’ played in the background, when the tableau passed. An expert committee is formed for selecting thetableausof the participating States.